Hopefully this counts toward my good deed of the day (or week...) It only takes a few minutes to do the above. In case you didn't know, I'm a crazy cat lover so I had to share this. 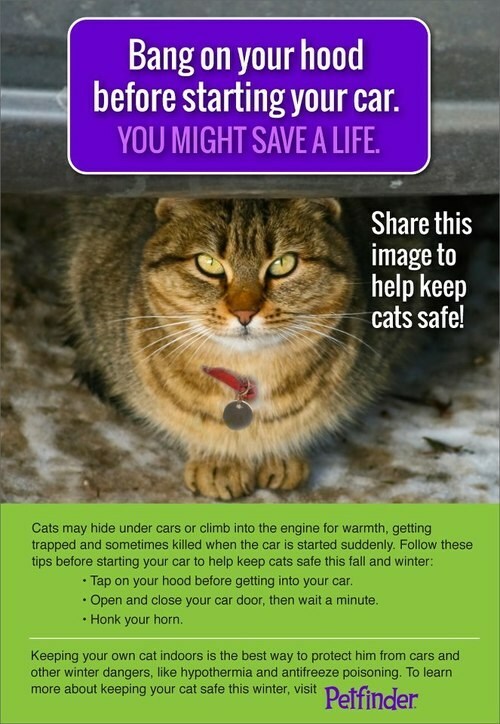 Especially because all of my furry loves are strays... As a matter of fact, my first cat, Nemo, was found under a car, thank goodness the person checked before driving off!!! Great post! My uncle got his first cat - aptly named lucky - because a stray did that same thing (climbed into the engine for warmth)and when he drove a bit the car sounded odd - opened it up and there was a scared but ok kitty!